The BSIV compliant TVS Jupiter introduces two new colour options and auto headlamp-on feature. Sync Braking System now standard across all the variants of the scooter. You might already know that starting April 2017 all the new two-wheelers sold in India must comply with BSIV norms. So what that means is that all the two-wheeler manufacturers are currently busy updating their products so as to meet the deadline. The latest manufacturer to launch BSIV variants of its existing line-up is TVS as the company has just rolled out the BSIV compliant versions of the Jupiter. 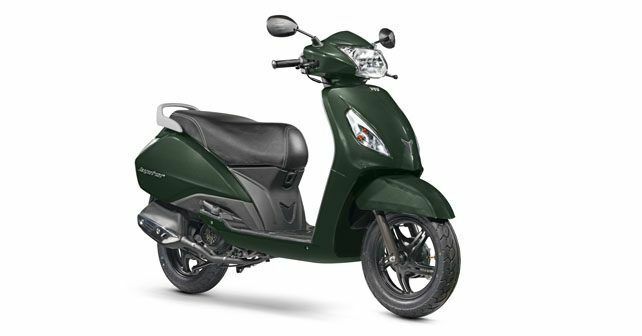 In addition to that, the manufacturer has added two more colour options, auto headlamp-on (AHO) feature and Sync Braking System (SBS) to the scooter. Prices of the TVS Jupiter range have not been revised and it starts at Rs 49,666 (ex-showroom, Delhi). The powertrain of the TVS Jupiter is largely unchanged, meaning it’s powered by the same 110cc single-cylinder air-cooled engine that develops 7.89bhp @ 7,500rpm and 8Nm of torque at 5,500rpm. Power transmission duties are carried out by a CVT automatic. As for the other updates, SBS is now standard on all the variants of the scooter. In case you don't know, the SBS automatically activates the front brake when the rear brake is applied. The TVS Jupiter was launched in the country in 2013 and has been one of the best-selling products for the company. Over the years, TVS has sold over 1.5 million units of the scooter in the Indian market.